Here are some things that you could do (actually, mostly eat) to maximize your trip to Lucban during the Pahiyas Festival. Note that this list is not only limited during the festival. You can also opt to visit Lucban any other days of the year and still be able to try out these things. If you want to explore Lucban but do not plan to join the festival, please do not go during the week of May 15 as Lucban will be very crowded during this time of the year. 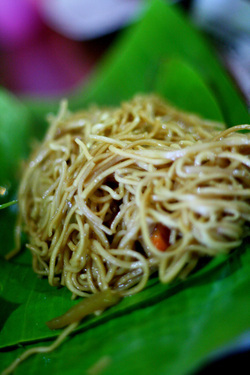 Pancit habhab is a Lucban specialty and tastes best when eaten hinahabhab. Which food doesn't taste good when you use nothing but your hands to eat. :) This time, you don't actually use your hands to eat but you would use your hands to push the pancit, conveniently served in a banana leaf, into your mouth. :) Pancit habhab is mostly similar to other pancit varieties in the country but prepared and served a little bit differently. The noodles, they say, are not the same. Although pancit habhab looks very similar to pancit canton, habhab uses miki Lucban. And serving it in a banana leaf makes it unique compared to other pancit of other provinces. When we were there during the Pahiyas Festival, pancit habhab costs only 15 pesos for a mirienda-sized serving. Not bad at all! Like any other longganisa, the Lucban version is best served with fried rice and egg, much like the usual longsilog meals in the Philippines. What makes Lucban Longganisa different is its strong garlic smell. The ones we tried in a small local carinderia was very soft and loosens up very easily once its out of its skin. Vinegar is its best condiment. If you are going to eat in local carinderia, it usually costs about 50 pesos per serving. If you would like to take home a dozen, one tali of 12 pieces would cost 150 pesos. Not sure if the prices would be the same or cheaper during non-festival season. Kamay ni Hesus was where we conveniently parked during the Pahiyas Festival. It is around 1km away from the Lucban town proper and is located in Brgy. Tinamnam, Lucban. Kamay ni Jesus is popularly known for the healing masses it holds during Wednesdays and Saturdays. From the road, you would see the 50-foot statue of the ascending Christ so you shouldn't miss it. The Kamay ni Hesus grounds also house peaceful greeneries and a beautiful church. On your way up the hill to the ascending Christ, you would pass by stations of the cross since this is also a place of pilgrimage. Kiping only costs 10 pesos for each small paper plate (as shown above). Kiping are leaf-shaped rice delicacy, quite similar to a wafer, which are used to decorate the houses during Pahiyas Festival. It is usually crushed and sprinkled with sugar when served. Without sugar, it would taste very bland. There are 2 routes going to Lucban from Manila. One is thru Pila/Nagcarlan/Liliw and another one through Tayabas. 1. From South Super Highway, take Santo Tomas exit and drive all the way to Tiaong. 2. Once you get to Tiaong, turn right to the road leading to Tayabas. 3. Drive straight passing through Candelaria and Sariaya until you reach Tayabas. 4. Once you see the Minor Basilica of Tayabas, turn left and look for the road leading out of the town proper and back to the national road leading to Lucban. You'll pass by Kamayan sa Palaisdaan through this route. 1. From South Super Highway, exit in Calamba and drive straight until you see SM Calamba. 2. Turn right and drive straight to Pila. Before you reach Pila town proper, turn right and drive down all the way to Nagcarlan. 3. Once you reach the Nagcarlan town proper, turn left to the road leading to Liliw and Majayjay. 4. Drive all the way to Lucban passing through the towns of Nagcarlan and Liliw. This is a good route going back to Manila so you can do side trips to these interesting towns. 1. From LRT-Buendia or Cubao bus terminals, look for buses bound to Lucena. Ask the driver to let you off at Lucena Grand Central Terminal. 2. Once you are there, look for jeepneys bound for Lucban. 3. Get off at the grotto or Kamay ni Hesus. Most people would drop off here so you shouldn't miss it.